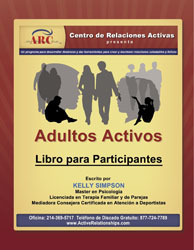 Active Adults for Spanish-Speaking Communities is 12 units, each with A and B sessions. It includes topics ranging from communication skills, emotion management, conflict resolution, making budgets, wise choices for friends, dating and marriage, recognizing personal strengths and future planning. Sessions include experiential activities. This Spanish edition utilizes culturally appropriate examples, communication style and analogies. *Note: ARYA is not currently available in Spanish.